An English hospital has said it will no longer take in patients from Wales except emergencies and maternity cases. The Countess of Chester NHS Foundation Trust decision will impact on thousands of people in Flintshire who currently use it, with immediate effect. The decision follows a row over payments to the hospital for caring for patients from Wales. A Welsh Government spokesman said limiting access to Wales' patients on financial grounds was "not acceptable". GPs in Wales will no longer be able to refer patients for treatment over the border at the hospital. Wrexham Maelor Hospital and Ysbyty Glan Clwyd are the next closest hospitals for patients in the area. 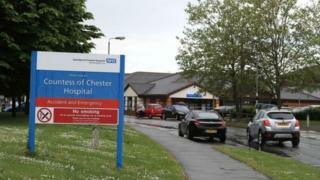 Chief executive of Countess of Chester Hospital, Susan Gilby, said it was "a difficult decision" down to "unresolved funding issues". "Unfortunately, the trust is currently unable to accept any new elective work relating to patients living in Wales. "We will of course honour any existing appointments so there will be no disruption for patients already waiting. "This is a difficult decision that has been taken with great reluctance." Ms Gilby added that contract negotiations were continuing and the trust was working with Betsi Cadwaladr University Health Board in north Wales to resolve the issue. The trust's chairman, Sir Duncan Nichol, previously said caring for patients from Wales was "hard to countenance" due to costs. The trust told BBC Wales in October 2018 that 23,500 patients from Wales were treated over the border in 2016-17 for mainly secondary care, which cost £31.2m. Evan Moore, from Betsi Cadwaladr, said they were working to "accommodate newly referred patients" within existing services in Wales. "We will be writing to all affected GPs and medical staff to inform them of these changes," he told the Local Democracy Reporting Service. Mr Moore added that the decision did not affect cancer patients, urgent elective patients already referred to COCH or non-elective patients such as A&E patients or maternity patients. A Welsh Government spokesperson, said it was not a decision they had taken themselves. "Along with NHS Wales representatives, Welsh Government has agreed a process of engagement with Department of Health and Social Care officials and representatives from the English NHS to discuss cross-border payment arrangements," a spokesman said. "In the context of ongoing engagement, any actions taken by English providers to limit access for Welsh patients on financial grounds are unacceptable and not in the spirit of reaching a cross-border agreement with English NHS representatives." Labour MP for Alyn and Deeside, Mark Tami, said all parties must work towards ensuring patients from Wales can continue to be treated in Chester. "The Countess of Chester was built to care for patients within its proximity - which included people in Flintshire. It's very important that this continues to be the case," he said. Doctors from the Marches Medical Practice said they were "extremely disappointed" at the decision. "We feel strongly as a cross-border practice that patients should be free to choose where they are treated and are extremely disappointed that our patients could be adversely affected by this policy."